IT CAME FROM ALLEN'S BRAIN! 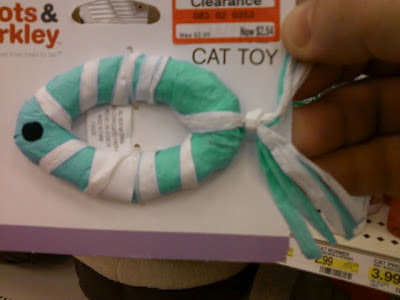 : A toy for a Christian cat? A toy for a Christian cat? No longer does your Christian cat have to hide his faith! Never again will she have to project her beliefs in uncool ways that embarrass her in front of her heathen feline peers! Behold! The ichthus cat toy! He may not have nine lives, but now it will be evident to all that his eternity is secure, just like his owner's! Hallelujah! My kitty is more spiritual than your kitty!